It is the policy of the school to make all students work seriously and regularly throughout the year. To encourage this, the school shall conduct series of periodical tests to assess and evaluate their academic achievement. It is compulsory for all students to appear in all tests. 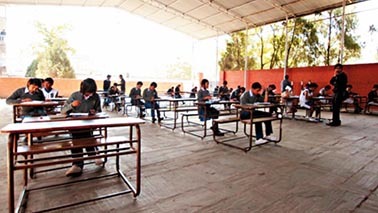 The school will hold tests divided into four terms. Each term will be divided into 25 and 75 marks, 25 marks for practical test and 75 marks for written test respectively. A student must secure at least 40% marks in all subjects to be eligible for promotion to the next higher class. A student may be debarred from a test or tests on ground of indiscipline or copying or attempting to copy in an examination. If a child fails to take any test, the School authorities must be immediately informed. No retest will be conducted. No weightage shall be given for absence in tests. The Principal’s decision regarding promotion and detention shall be final. The management reserves the right to change the rules as when necessary.